The Nineteenth century descendants of Abraham Faw leave stories of nearly Faulknerian grandeur and dissolution. It is a somewhat sketchy story and never before pulled together as a whole. The pieces derive from the Lowe family Bible of Abraham Faw and also his will, and a multitude of internet sources. It would be helpful if the Faw graves in Alexandria remained, for some of these descendants were reportedly buried alongside him. I hope that new information can be found over time to support and refine these lines of the Faw family. 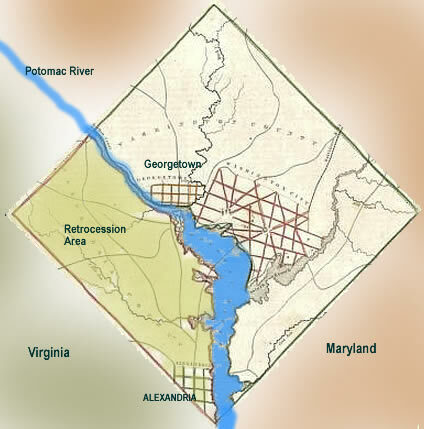 The Alexandrians lived in the milieu of an emerging U.S. Capital in the District of Columbia. To paint the scene, the area of Georgetown is the primary port, residential and business section of DC, and from there the Masons parade in the 1790’s to place cornerstones of the White House, and also the US Capitol, with George Washington using the silver trowel. It also is a story colored by the survival of the U.S. Capital of the War of 1812, and the movement towards the eventual retrocession of the Virginia portion, and later the succession of the state of Virginia and the support of the southern cause by Abraham’s namesake. Jacob Leonard’s identity is an assumption, parts fit the overall narrative well, but it retains a trace of uncertainty. It is hoped we might one day validate or deny his place in the story. Abraham Faw’s eldest daughter, Sophia Eliza, married a Jacob Leonard in 1814. 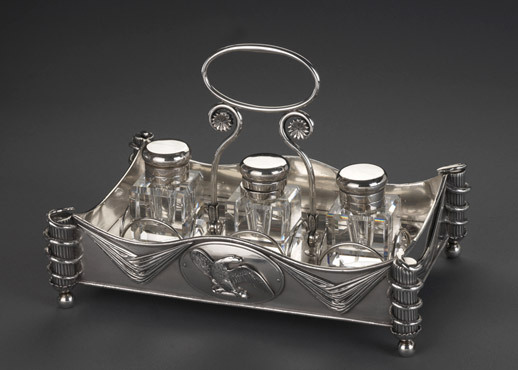 A candidate for this Leonard is a Georgetown silversmith and watchmaker, who is known for a few coin silver pieces, some of the first skippets for US treaty imprint, but most importantly, for the elegant inkstand ceremoniously brought out each day at the US House of Representatives, a piece commissioned after the burning of Washington by the British, meant to symbolize the survival of the national government. A Juliana Leonard born of this union died at fifteen in 1830. A first namesake son, Abraham Faw Leonard, died in infancy. Of the second namesake son, born 1820, we’ll explore in detail later in the story. An infant Leonard also later died soon after birth. 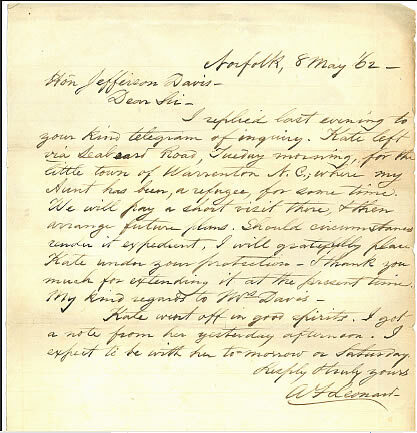 Abraham Faw, in his will, apparently had no further affection for Mr. Leonard, for it seems his daughter and children may live back in Alexandria, and Faw goes to length to specify that Leonard shall have no part of the lands he leaves her, in addition, two close friends are set as guardians to insure her estate is protected from him until Leonard’s death, which comes in 1829. He is buried in Congressional Cemetery in Washington, DC. Faw’s second daughter, Juliana, marries the Rev. Enoch M. Lowe of Martinsburg, WV in 1815 and he takes the Rector position at Christ Church in Norfolk, VA but he only lives until 1823, and she does not reappear in the record. She is named in a Lowe letter recorded in the memoirs of Rev. Benjamin Allen. Faw’s second son, William H. S. Faw, served in the War of 1812, after briefly opening a hat shop in Alexandria, then removes to Washington, KY and marries Nancy Williams in 1820. They have a child, Elizabeth Faw, but William dies soon thereafter, perhaps also her mother Nancy dies, for she is said to be in the guardianship of one Milton Taylor, until majority, in Abraham Faw’s will. Notes online suggest that Elizabeth Henry Faw may have married first a Daniel E. Jones, then a Jeremiah J. Talbot or Tolbert in Jefferson, KY. Then she died in 1896, and had a child Maggy M. Tolbert. Now forward with the story of Abraham Faw Leonard, 2nd. He studies under Rev. Enoch M. Lowe and also Rev. George Halson, and then graduates from Princeton University in 1838. He serves in the Virginia legislature. He studies the bar under famed Norfolk attorney William Sharp, practices until 1854 and becomes the editor of the Southern Argus newspaper in Norfolk, VA, taking up the southern cause. The paper also strongly supports the local Dorcus Society, an organization devoted to providing clothing to the poor. He first marries the daughter of another famous Norfolk lawyer, William Talbot. Virginia Talbot Leonard lives until 1850, but leaves a child and dies one month later at twenty-two years of age. A. F. Leonard marries second, Miss Louisa Dickson, sister of Richard Dickson, Esq., of Norfolk, and Mrs. Tazewell Taylor. by A. F. Leonard - tune of "Friend of my Soul"
Her plains in beauty lie. No dearer spot we view. And guard their country's shrine. And yield to nothing wrong." Leonard marries a third wife, Caroline Davis, niece of Confederate President Jefferson Davis, at her father’s Hurricane Plantation on the Mississippi. Over three hundred slaves serve the plantation of her father, though he rules under a philosophy of benign command and an imagined community of shared interests and mutual benevolence. The plantation is near Vicksburg, and burned by the Union troops. In 1859, a tragedy strikes the Leonard family when the son, nine year old Virginius Leonard is said to be stabbed in front of the National hotel In Norfolk and dies on the sidewalk, declared murdered. However a day later, the coroner finds that he dies by gunshot by his own hand, apparently accidentally. Mother Virginia Talbot who died soon after childbirth, and son Virginius Leonard are buried next to one another in Cedar Grove Cemetery in Norfolk, VA.
Leonard suffers his own tragedy, falling through a trap door in the street and becoming crippled. His lameness keeps him out of service in the Civil War. It is then reported by Varina Davis in letters that Caroline has become ill-tempered and wild, which will become clearer in her condition later, and she drives Leonard to drink. As Norfolk falls, the Leonard’s retreat to Stokes County, NC and a few years pass during the war. He tutors children, and later back in Norfolk, resumes the newspaper. His health declines, his fortunes and investments have all failed, and he dies in Alexandria in 1870.
Letters pass between Jefferson Davis and Leonard, assuring the safety of his niece’s removal from Norfolk and the war. Jeff Davis visits the family at their Norfolk home. By the 1890’s Caroline Leonard is declared insane, and destitute, dies in a Williamsburg mental hospital and is buried in a city cemetery, apparently with no marker. Sophia Eliza Leonard remarries, the brother to Enoch M. Lowe, John F. M. Lowe of Alexandria. A decade brings five more children though two die in infancy: Robert Steed Lowe, Enoch M. Lowe, Jane Richard Lowe, Juliana Lowe, and Mercer Lloyd Lowe. The two Lowe brothers form a connection back to Prince George’s County, MD and patriarch Lloyd Mercer Lowe of Hatton Hall and Belleview. They are both Uncles to Maryland’s second Governor from Frederick, MD – Enoch Louis Lowe, who connected by his father’s marriage to the infamous Vincendiere family of L’Hermitage at the Best Farm, now part of Monocacy Battlefield, and site of an archeological study of the slave plantation. Enoch Louis Lowe was the only child of Bradley Samuel Adams Lowe and Adelaide Bellumeau de la Vincendiere. 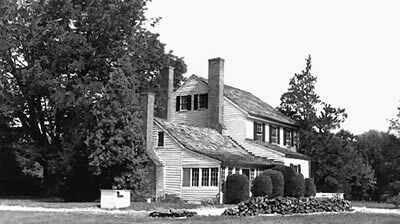 His birth occurred in the manor-house of The Hermitage, an estate of one thousand acres lying on the Monocacy River, Frederick County, Maryland, August 10th, 1820. John F. M. Lowe, second husband of Sophia Eliza Faw is made manager of Belleview by his father for the benefit of his sisters, Sophia Lowe and Leonora Steed Lowe who live there, for a term of seven years, by Lloyd M. Lowe’s will. In 1856 it passes to Leonora’s husband, James M. Steed. Many of these descendants are buried at Steed Cemetery near the former plantation house location. It is from this family that we eventually learn the complete circle of the Abraham Faw family, through their preservation of the Lowe family Bible and its recordation at the Maryland Historical Society in Baltimore, MD.